Posted on Tue, Jul 28, 2009 : 2:25 p.m.
Michigan coach Rich Rodriguez said "it's natural" to look at the turnaround he engineered in his second year at West Virginia and expect the same thing at Michigan. "But it’s a different scenario," Rodriguez said. "The biggest difference is I had a quarterback that was my starter the first year, Rasheed Marshall, who had gotten hurt but he had at least started some games and he came back and was very talented and fit the system." Rodriguez went 3-8 in his first season at West Virginia, then led the Mountaineers to nine wins and a Continental Tire Bowl berth in 2002. After last year's 3-9 season, the Wolverines are hoping for a similar success this year. "There are some parallels," Rodriguez said. "And we draw on that, not from the standpoint of it’s going to be the same. It ain’t the same, everything’s different. But having been through it before, we’re not panicking and know that the process is in place and it’ll be all right." Denard Robinson to get a lot of reps.
Rich Rodriguez on Penn State's Sean Lee. Rodriguez and entertainer Jamie Foxx hit it off. Michigan defense will look different, Rodriguez says. Feeling pressure? Nah, says Rodriguez. "Lights are pretty bright" at Michigan, Rodriguez says to media. Freshman will be important this year, Rodriguez says. Rodriguez on last year's Ohio State game. Rodriguez on what's needed at quarterback. 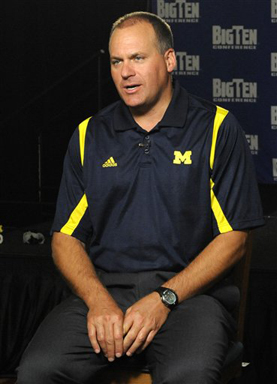 Michigan wants a BCS foe for 2010 opener. Thu, Jul 30, 2009 : 9:54 a.m.
Tue, Jul 28, 2009 : 10:44 p.m. I think the offense will be leading away this season. Tate should provide a dramatic improvement in the passing game which will open the running game. The b10 defenses will be totally confused. The defense will be kind of week but all we need to do this season is out score the opposing team and keep the ball for as long as possible. 7-5 is my record but if Tate plays well we could see 9-3. Tue, Jul 28, 2009 : 6:08 p.m. I think 9-3 is reasonable. The only question is whether the BIG STORY in the state is UM's turnaround or MSU's "turnaround" that takes them back to a place to which they are more accustomed. I think it would be just desserts if MSU finished 3-9 this season, since their fans have had so much fun making fun of UM for that record. Speaking of "hope springs eternal," how can the fans of a team that is 28-67 against UM think that "their" program is now better than that of UM because they had one good year and UM had one bad year? Every time I hear an MSU fan brag about how they are "better than UM" or how MSU "dominates the state in recruiting," I am reminded of a joke about a mosquito and a drawbridge. Tue, Jul 28, 2009 : 4:34 p.m. I doubt there will be a turn around this season. I hope there will be, but I am doubtful. Look at the fraud that Notre Dame hired, how many years have they suffered? I am confident that RR will do a better job - anybody could (even a former HS coach). A comment was removed from this post because it constituted too much of an attack on another commenter. We encourage people to challenge ideas and disagree with opinions, but not in the form of an attack. Tue, Jul 28, 2009 : 3:43 p.m. I sure do like the way these new UofM coaches who came from West Virginia think and do. Confidence leads competence in sports, business and life. These guys know that their practices can make their players' experiences especially productive: Coaching helps develop good habits that happen by default in the game. Players receiving feedback allows them to fine-tune their skills. Working in a safe yet challenging learning environment is essential. These coaches encourage practice and development, and mistakes are viewed as learning opportunities. Clearly defining and developing a plan for achieving the players' personal and teamwork abilities result in wins within a measurable time frame. Tue, Jul 28, 2009 : 3:02 p.m.
Duh....4 wins is an improvement. Hope springs eternal for U of M fans yet a Motor City Bowl might be the best you can do.